USBTrace is an easy to use and powerful USB analyzer (USB traffic sniffer) software. USBTrace can analyze USB protocol at host controllers, hubs and devices. This is a 100% software product. USBTrace supports Windows 2000, XP, 2003/2008 Server, Vista, Windows 7 and Windows 8/8.1 operating systems and works with USB 1.x, 2.0 and 3.0 (low, full, high & super speed) host controllers, hubs and devices. Analyze USB 3.0 protocol at controllers and devices. Decodes 3.0 standard descriptors and requests. Supports USB Device Class Decoding. Capture and Analyze all USB requests exchanged during device enumeration. Does not use filter drivers. Search / Filter / Trigger / Export. Search captured data. Filter out unwanted data. Set trigger points. Export captured data. For high performance/non-stop capture sessions. Detailed performance analysis for your device/driver. Supports the latest version of Windows. x86/x64 editions of all Microsoft Windows releases supported. 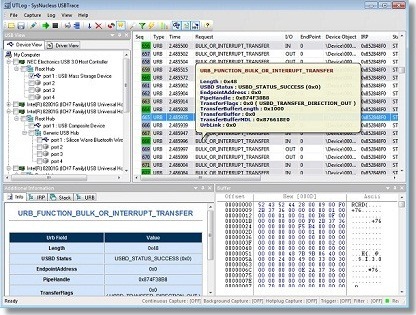 USBTrace is an invaluable tool for all those who develop/test firmware and drivers for devices which connect to the PC using the Universal Serial Bus. USBTrace is an easy-to-use USB protocol analyzer. To analyze a USB device, just select the device and click the 'capture' button. See USBTrace Quick Start Guide. With USBTrace you can analyze USB protocol traffic at USB Host Controllers, USB Hubs and USB devices. The tool captures and displays USB Control, Bulk, Interrupt & Isochronous transfers. USBTrace decodes and displays both standard and class specific USB descriptors (Device, Hub, Configuration, Interface, Endpoint, Class Specific, IAD, String) and Windows enumeration information. 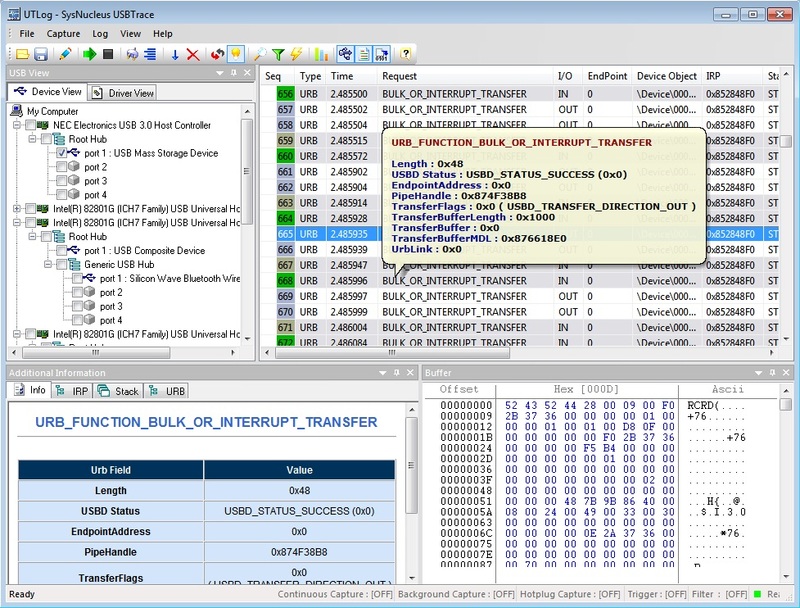 Unlike other software based USB analyzers, USBTrace does not use any filter driver to capture the USB requests. So USBTrace will not disturb/slow down the PnP system due to its presence. USBTrace is capable of capturing all USB requests exchanged between the host controller/hub and the device during device enumeration. See USB Enumeration Explained to know how USBTrace is different from other USB monitor software. The IRP, URB and IO_STACK_LOCATION structures associated with each captured request is decoded and displayed by USBTrace. Also, in addition to capturing URBs, USBTrace captures Internal USB IOCTLs, User mode USB IOCTLs, PnP and Power IRPs. See Complete List of USB requests captured by USBTrace. USBTrace also allows device driver developers to capture USB requests made/received by any device object in the USB device stack. Captured data can be exported as HTML, XML, Text or CSV reports. Detailed device information can also be exported. This feature will help you to document the device behavior as well as to share the captured data/device details in an easily readable form with others. We recommend that you download the evaluation version or take the product tour to learn more about the features of our USB Analyzer. You may either subscribe to our mailing list, follow us on twitter or read our blog for updates.